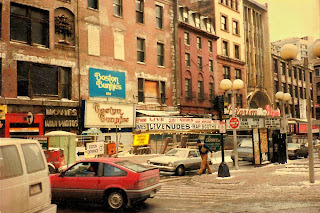 I love looking at old pictures of what Boston used to be like. There's a bunch of them hanging in the hallways of my apartment complex and then this one I shamelessly stole off of John Keith's Boston Real Estate Blog. John, if you're reading - I meant to link back to your original post, but you're too prolific a blogger. I kept on pressing the 'older entries' button for a solid 5 minutes and still did not make my way back to the post. I thought it was only from a week ago, but I couldn't find it. So instead, I'm linking to your main page (here). Keep up the good work, I read your blog daily. Can you identify that area? Near the T stop, where the RMV is, and now the new Archstone Boston Common area. Click the image to get it full-sized. 3 Response to "Chinatown 23 Years Ago"
Us locals called this area the Combat Zone. However, horrible advertising and trendy buildings now renamed it the Ladder District. I still have no clue what the name means. That's Essex Station before it was renamed as Chinatown. Will, someone came up with the name of the Ladder District by comparing the street grid in that area to the shape of a ladder (specificially the streets between Tremont and Washington from Boylston to Winter). I get their intention, but as local, it has no real meaning to me either. I just call the whole area "Downtown." the ladder district has been the ladder district far longer than you've been alive. Way before the combat zone.